Sunday May 28, 2017, at 2:00 pm. given by Anna Fishman Gonshor. For more information, please call (416) 635-2883 ext. 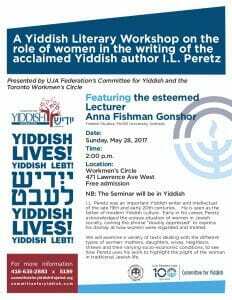 5189 or email committeeforyiddish@ujafed.org. See flyer below for details.